The average visitor to Flagstaff is 47 years old, makes more than $100,000 a year, brings two other people along – often, family members – spends nearly $600 a day with his or her group and stays about three nights. Half of the 5.5 million guests who visit come specifically for Flagstaff. About a third are primarily here to see the Grand Canyon, while others are on their way to the Phoenix metropolitan area or Sedona. These are the findings of the Flagstaff Convention & Visitors Bureau 2017-2018 Visitor Profile, formulated by Tom Combrink, Ph.D., senior research specialist with the Alliance Bank Economic Policy Institute and the W.A. Franke College of Business at Northern Arizona University. Of all the visitors, 57 percent are from out-of-state, mostly California, but also Texas, Wisconsin and Florida. Combrink says 30 percent are from elsewhere in Arizona and 13 percent are international visitors – nearly a third from Canada. The United Kingdom accounts for more than 13 percent of the international market, Australia makes up 7 percent, and France and Germany each bring in 6 percent. Meanwhile, China is an emerging market, one that tourism officials are courting. During a meeting at the High Country Conference Center last month, tourism officials released the Flagstaff Convention & Visitors Bureau FY 2018 Annual Report revealing that tourism showed gains again last year and maintained its position as the city’s No. 1 economic driver. “It’s Flagstaff’s time to shine,” said Mayor Coral Evans. FCVB Director Trace Ward said tourism supports an estimated 8,000 jobs and delivers $500 million to the local economy. Tax revenue generated by the industry through the 2 percent Bed, Board and Beverage (BBB) tax is up 8.47 percent, contributing to the quality of life for residents by funding beautification, city parks, open spaces, education and entertainment through arts and science events. Flagstaff’s many arts and science events contribute to an increase in tourism, economic impact and funding for beautification efforts. 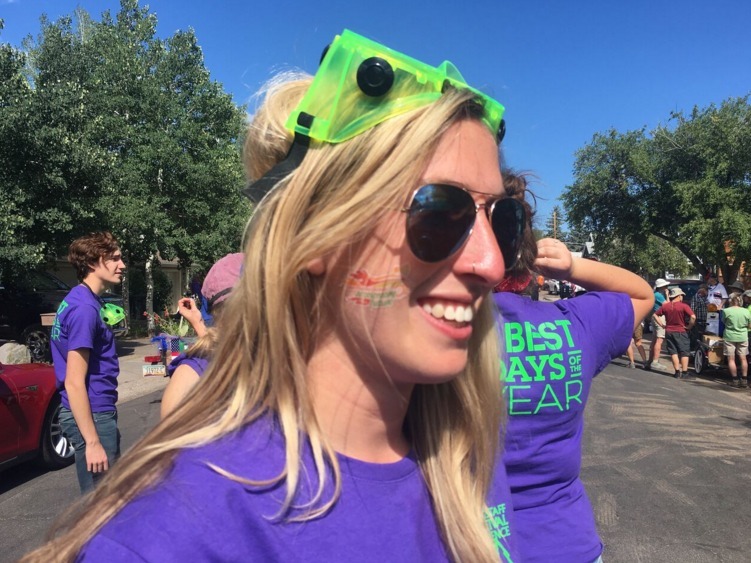 Donning a temporary face tattoo, “Accelerating into the Future,” volunteer Sydney Chittum promotes the Flagstaff Festival of Science in the popular Fourth of July Parade.